The Arizona State University Alumni Association will honor alumni and faculty of ASU who have served in the U.S. military or whose work has made a contribution to the military, national defense efforts and veteran services at its annual Founders’ Day Awards Dinner, 7 p.m., Feb. 21 at the Arizona Biltmore Resort & Spa, 2400 E. Missouri Ave., Phoenix. The following individuals will be honored by the Alumni Association at the Founders’ Day event. Tillman is being honored posthumously for his leadership and extraordinary contributions to ASU football, professional football and the U.S. Army. Tillman started his career as a linebacker at ASU in 1994. By his senior year, he was voted Pac-10 Defensive Player of the Year, and played on the Sun Devils’ 1997 Rose Bowl team, which went 11-0 during the 1996 regular season. He was selected by the Arizona Cardinals in the 1998 NFL draft and shifted to the safety position during his rookie year. Tillman turned down a five-year, $9 million contract offer from the St. Louis Rams out of loyalty to the Cardinals. In May 2002, eight months after the 9/11 terror attacks, Tillman enlisted in the U.S. Army. He participated in Operation Iraqi Freedom, and was later re-deployed to Afghanistan, where he died on April 22, 2004. In 2004, a group of Tillman’s family members and friends created the Pat Tillman Foundation, an organization that pledged $1.25 million to ASU to create and endow the Tillman Scholars-ASU Leadership Through Action™ program at the W. P. Carey School of Business. Tillman was inducted into the College Football Hall of Fame in 2010. This year, one alumni honoree has been selected to receive the Alumni Achievement Award from each branch of the United States armed forces. U.S. ARMY – Brig. Gen. Victor Petrenko ’83 B.S. Brig. Gen. Victor Petrenko began his military career as an ROTC student at Arizona State University. He was a distinguished military graduate at ASU, majoring in justice studies within the College of Liberal Arts and Sciences, and received a commission into the U.S. Army’s field artillery program. His initial assignment was with a battalion within the 3rd Armored Division in Germany. He served in field artillery command positions at Fort Bragg, N.C., and Saudi Arabia, the latter as part of Operation Desert Shield/Desert Storm in 1990 and 1991. Following studies at the Army’s Command and General Staff College at Fort Leavenworth, Kan., he received a master’s degree in public administration from the University of Missouri-Kansas City. In March 2000, he assumed command of a field artillery battalion in the 82nd Airborne Division at Fort Bragg. Upon his relinquishment of that command, he deployed to participate in Operation Enduring Freedom in Afghanistan. In 2003, he attended the Naval War College in Rhode Island and earned a master’s degree in national and strategic studies. He went to Fort Bragg again as the commander of the 82nd Division Artillery and 4th Brigade Combat Team, as well as chief of staff for the 82nd Airborne Division and Combined Joint Task Force 82 from 2006 to 2008, then served as the chief of staff of the Fires Center of Excellence at Fort Sill (Okla.) in 2008 and 2009. 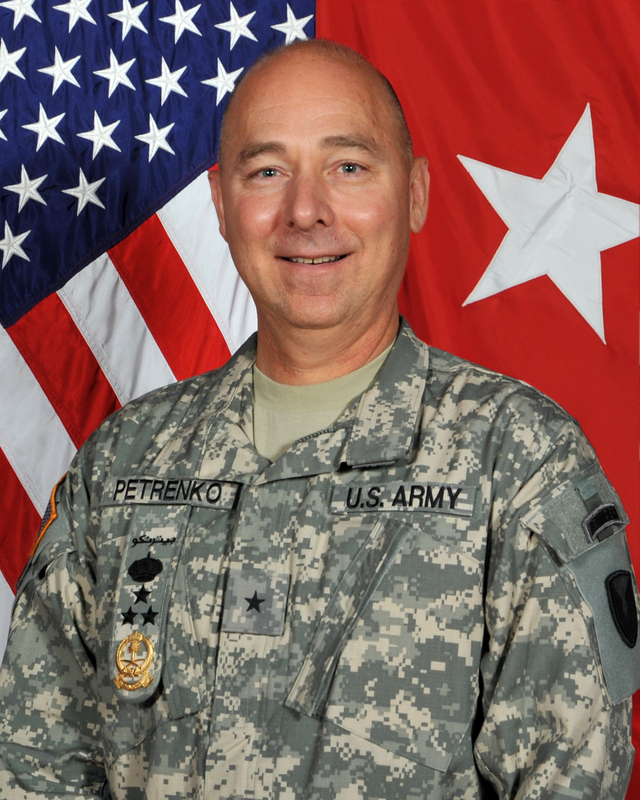 Petrenko then served as the deputy commanding general and chief of staff for U.S. Army Accessions Command at Fort Knox. Currently, he serves as the program manager for the Saudi Arabian National Guard Modernization Program in Riyadh, Saudi Arabia. Petrenko’s decorations include the Legion of Merit, the Bronze Star Medal, the Meritorious Service Medal, and the Army Achievement Medal. U.S. MARINE CORPS – Brig. Gen. Daniel D. Yoo ’84 B.S. Brig. Gen. Daniel D. Yoo currently serves as the Commanding General, Marine Corps Recruit Depot, San Diego and the Western Recruiting Region. He received a Bachelor of Science degree in justice studies from the College of Liberal Arts and Sciences at Arizona State University in 1984. He was commissioned a second lieutenant in the U.S. Marine Corps after completing Officer Candidate School in 1985. A career infantry officer, Yoo has commanded at the platoon, company, battalion and regimental levels. Additionally, he has served in expeditionary, reconnaissance, Inspector-Instructor, special operations, and advisory units throughout his career. His professional military education includes the U.S. Marine Corps’ Infantry Officer’s Course, Amphibious Warfare School, the Naval Command and Staff College, and a National Security Affairs fellowship at the Hoover Institution on War, Revolution and Peace, Stanford University. Yoo also has served as a military fellow at the Council on Foreign Relations in New York City. His personal decorations include the Legion of Merit, Bronze Star Medal with Gold Star, Defense Meritorious Service Medal, Meritorious Service Medal with Gold Star, Joint Achievement Medal, Navy Achievement Medal, and the Combat Action Ribbon. He is a Marine Combatant Diver, a Military Freefall Parachutist, and a graduate of the U.S. Army Ranger School. U.S. NAVY – Rear Adm. Barry L. Bruner ’80 B.S. Rear Adm. Bruner graduated from Arizona State University in 1980 with a degree in civil engineering. After he was selected to serve in the Navy's submarine force, he attended Nuclear Power School in Orlando, Fla., and Prototype Training in West Milton, N.Y. While serving at sea, he served in various capacities, including weapons officer, aboard the USS Pollack. He also served aboard the USS Mariano G. Vallejo and the USS Newport News. He served as commanding officer of the Gold crew of the USS Florida from July 1998 to March 2001. Bruner has a master’s degree in oceanography and meteorology from the Naval Post Graduate School. He has worked at the U.S. Naval Academy as a company officer; as an action officer on the submarine directorate of the Navy Staff; and as executive assistant to the assistant to the chairman of the Joint Chiefs of Staff. His most recent assignment was as commander of Submarine Group 10 at Kings Bay Naval Submarine Base in Georgia. U.S. AIR FORCE – Brig. Gen. Mark C. “Marshal” Dillon ’83 B.S. Brig. Gen. Mark C. "Marshal" Dillon was commissioned in 1984 through Officer Training School, after graduating with a degree in aerospace engineering from ASU. He began his career as a space shuttle systems engineer. A command pilot with more than 3,500 flying hours, Dillon has commanded units ranging from the squadron to wing level at Travis Air Force Base, Calif.; the Altus Air Force Base, Okla.; and the Ramstein Air Base in Germany. In addition to his air command assignments, Dillon also completed staff assignments at U.S. Air Force headquarters and as the U.S. Transportation Command liaison to U.S. Southern Command. Currently, he works in the Office of the Deputy Under Secretary of the Air Force for International Affairs in Washington, D.C.
Dillon has a master’s degree in aeronautical science from Embry-Riddle Aeronautical University and a master’s in national strategic studies from the Air War College. U.S. COAST GUARD – Capt. John S. Kenyon ’85 B.S. Capt. John S. Kenyon graduated from Arizona State University in 1985 with a degree in broadcast journalism from ASU’s Walter Cronkite School of Journalism and Mass Communication. Kenyon served his country aboard the USCGC Gallatin, the USCGC Dallas, and the USS Cushing. In 1993, he volunteered for temporary duty aboard the flagship of NATO’s Standing Naval Force Mediterranean and conducted boarding/search/seizure training aboard NATO warships engaged in the United Nations’ embargo against the Federal Republic of Yugoslavia. His military career also has included shore-based assignments as division officer in the Port Security Directorate at U.S. Coast Guard headquarters in Washington, D.C., and as assistant chief of inspections for the Marine Safety Office in Port Arthur, Texas. Kenyon assumed command of Activities Europe on June 2, 2010, following a tour in Juneau, Alaska, where he served as chief of prevention for the Seventeenth Coast Guard District. Kenyon has a master’s degree in strategic studies from the U.S. Marine Corps War College in Quantico, Va., as well as a master’s degree in quality systems management from the National Graduate School. Faculty achievement at ASU is recognized at the Founders’ Day event with individual awards for contributions in research, service and teaching. Melissa Pritchard is being honored for her ability to create rich, nuanced educational opportunities for her students. During winter break 2009, Pritchard became an embedded journalist with five female soldiers serving on a Provincial Reconstruction Team in Panjshir Province, Afghanistan. She wrote profiles of the soldiers with whom she interacted when she returned. One of them, “Finding Ashton: A Soldier’s Story,” which focused on U.S. Air Force Sr. Airman Ashton Goodman, was published in O Magazine in May 2010. Goodman, 21, was killed by an improvised explosive device (IED) four months after Pritchard returned; to honor Goodman’s memory, Pritchard created the Ashton Goodman Fund to support the Afghan Women’s Writing Project (AWWP), an award-winning online mentoring program connecting American women writers with Afghan women writers. Pritchard has given lectures for military audiences; invited to speak as part of the Commandant’s Speakers Series at the Air Force Institute of Technology (AFIT) in Dayton, Ohio, she also offered a writing workshop to students there. Pritchard’s has published work in genres ranging from journalism and essay writing to short stories and novels. Her ninth book, a novel, will be published early next year. She serves on the artistic council for WordTheatre and is an advisory board member for the Afghan Women's Writing Project and the Lost Boys Center in Phoenix. Stephen Pratt is being honored for his research on the emergence of complex social behavior in leaderless and decentralized groups. Pratt’s work focuses on studying social insect colonies and deriving principles from that research that facilitate bio-inspired engineering solutions for complex military and national defense problems. For the past several years, Pratt has been a principal investigator for a research project funded by the Office of Naval Research: Heterogeneous Unmanned Networked Teams (HUNT) group, a multidisciplinary unit generating groundbreaking solutions for complicated military needs. Much of Pratt’s work with HUNT has focused on the design of robot networks that function without central control and which must adapt to the loss of members in rapidly changing and dangerous environments. Pratt has been a member of the editorial board of PLOS ONE since 2011 and has acted as an ad hoc reviewer for more than 85 publications, including Science, the Journal of Experimental Biology, and the Proceedings of the National Academy of Science USA. He has published 36 papers in highly ranked peer-review journals, and these contributions have accumulated nearly 1,300 citations from other authors. Pratt is a member of the Animal Behavior Society, the International Union for the Study of Social Insects, and Entomological Society of America. Steven Corman is being honored for his service to the United States military related to his research on verbal and written communication within organizations. His current research focuses on how Islamist extremists use narrative (story) to further their own aims, and how military officials and American diplomats can craft effective countermeasures. Shortly after the Sept. 11, 2001, terrorist attacks, Corman was approached by the United States military to participate in workshops designed to find effective ways to topple terrorist networks. In 2005, Corman became the director of the Center for Strategic Communication at ASU, which coordinates research focused on combating terrorism, promoting national security, and successfully engaging in public diplomacy worldwide. Currently, Corman is involved in two multiyear, multimillion dollar external grant projects. The first project seeks to better understand Islamic extremists and the way they use stories well known in the Islamic world to frame contemporary events and persuade audiences to adopt their ideology. The second project is funded by the Defense Advanced Research Projects Agency and studies the neurobiology of narrative comprehension and persuasion. He is the author of two books: “Weapons of Mass Persuasion” and “Master Narratives of Islamist Extremism.” In 2011, he received the Award for Exceptional Scientific Achievements and Contributions from the Human Social Culture Behavior Modeling Program of the U.S. Department of Defense. Tickets to the Founders’ Day event are $130 for Alumni Association members and $175 for nonmembers. Table and corporate sponsorship opportunities are available. For additional information about Founders’ Day, or to RSVP, visit http://alumni.asu.edu/foundersday. The ASU Department of English offers a sugar-free alternative to Valentine's Day: a reading on "Love and Other Marvels" by its faculty in the Masters of Fine Arts program in creative writing. On Valentine’s Day, some lovers dine in noisy restaurants. Others empty their wallets on chocolates or stuffed bears holding hearts. The event starts at 7:30 p.m. in the Memorial Union’s Pima Auditorium and features short readings by ASU professors Sally Ball, Norman Dubie, Beckian Fritz Goldberg, Cynthia Hogue, T.R. Hummer, Tara Ison, Melissa Pritchard, Alberto Alvaro Ríos, Jeannine Savard, and Peter Turchi. What can attendees expect besides lots of love? Turchi, professor of English and director of the creative writing program, said the annual faculty reading "is an opportunity for us to share a bit of our work with ASU creative writing students – and there are nearly 400 of them – as well as with the wider university community and the public. It's a unique event: each individual reading is brief, and the audience gets to hear a wonderful variety of voices. It's also the only time each year that we all hear each other read, and there are always some surprises." 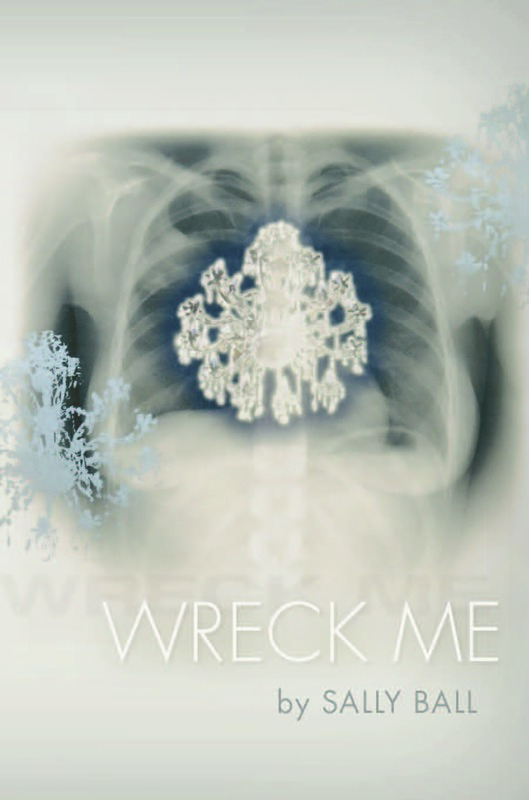 Ball’s reading will include poems from her forthcoming collection “Wreck Me” (Barrow Street Press, 2013): “because Valentine’s Day is when so often we use that command, *wreck me* – less overtly, most likely,” she said. Doors open at 7 p.m. Readings begin at 7:30 p.m. “Love and Other Marvels” is open to the public. For more information, contact Corey.Campbell@asu.edu. The Department of English is an academic unit of the College of Liberal Arts and Sciences.